Dental implants have revolutionized dental rehabilitation: Prosthetic dentistry and maxillary reconstruction [1Algraffee H, Borumandi F, Cascarini L. Peri-implantitis. Br J Oral Maxillofac Surg 2012; 50(8): 689-94. [http://dx.doi.org/10.1016/j.bjoms.2011.11.020] [PMID: 22197573] ]. They have become a vital treatment option in dentistry for the replacement of missing teeth and restoration of function in different clinical situations. Implants are reported to be functionally stable with long-term success rates. In the present scenario, survival rates of root form dental implants vary from 85% to 95% and higher for single implants and removable prosthesis [2el Askary AS, Meffert RM, Griffin T. Why do dental implants fail? Part I. Implant Dent 1999; 8(2): 173-85. [http://dx.doi.org/10.1097/00008505-199908020-00011] [PMID: 10635160] , 3Weiss CM, Weiss A. Principles and practice of implant dentistry 2001.]. Misch have suggested a success rate of 90% for 5 years and success rate of 85% for 10 years in patients with dental implants [4Misch CE. Dental implant prosthetics 2005.]. Success rates of root form dental implants are determined by various factors like location of the implant placement, patient’s systemic and local factors, the expertise, experience, and decision of the surgeon and the type of implant anchored [5Porter JA, von Fraunhofer JA. Success or failure of dental implants? A literature review with treatment considerations. Gen Dent 2005; 53(6): 423-32. [PMID: 16366052] ]. Taking all these factors into consideration, placement of dental implants in the jaw bones appears to be a safe treatment modality. Nevertheless, in the past few years increasing evidence on the presence of peri-implant pathology representing one of the most common complications involving both surrounding soft and hard tissues which can cause loss of the implant [6Smeets R, Henningsen A, Jung O, Heiland M, Hammächer C, Stein JM. Definition, etiology, prevention and treatment of peri-implantitis: A review. Head Face Med 2014; 10: 34. [http://dx.doi.org/10.1186/1746-160X-10-34] [PMID: 25185675] ]. Failure of a dental implant is frequently linked with failure to osseointegration. A dental implant is considered as a failure if it shows mobility or reveals peri-implant bone destruction of more than 1.0 mm in the first 12 months and greater than 0.2 mm a year after [7Prathapachandran J, Suresh N. Management of peri-implantitis. Dent Res J (Isfahan) 2012; 9(5): 516-21. [http://dx.doi.org/10.4103/1735-3327.104867] [PMID: 23559913] ]. The term peri-implantitis was first presented in the 1980s, described as a progressive inflammatory disease of the hard and soft tissues surrounding an implant caused by an infection, which is accompanied by bone resorption, decreased osseointegration and increased pocket formation beyond normal biologic remodeling [8Renvert S, Giovannoli J-L. Peri-implantitis 2012.]. In analogy to gingivitis and periodontitis affecting the periodontium of natural teeth, an inflammation, and destruction of soft and hard tissues surrounding dental implants are termed as mucositis and peri-implantitis [6Smeets R, Henningsen A, Jung O, Heiland M, Hammächer C, Stein JM. Definition, etiology, prevention and treatment of peri-implantitis: A review. Head Face Med 2014; 10: 34. [http://dx.doi.org/10.1186/1746-160X-10-34] [PMID: 25185675] , 9Wilson V. An insight into peri-implantitis: A systematic literature review. Prim Dent J 2013; 2(2): 69-73. [http://dx.doi.org/10.1308/205016813806144209] [PMID: 23726497] ]. Thereby, transitions are often smooth and not easy to differentiate clinically [6Smeets R, Henningsen A, Jung O, Heiland M, Hammächer C, Stein JM. Definition, etiology, prevention and treatment of peri-implantitis: A review. Head Face Med 2014; 10: 34. [http://dx.doi.org/10.1186/1746-160X-10-34] [PMID: 25185675] , 10Schwarz F, Sahm N, Becker J. Aktuelle aspekte zur therapie periimplantärer entzündungen. Die Quintessenz 2008; 59(5): 521-30.]. There are typical clinical and radiographic features for peri-implantitis. Radiographic signs include vertical bone destruction with typical saucer-shaped morphology, well-defined radiolucency with the presence of bone in the apical part of the fixture. Clinical features include deep pocket formation around the implant, edematous enlargement of peri-implant soft tissue, bleeding while probing and suppuration on digital pressure and pain is an uncommon finding, which if present, is usually accompanying acute infection. The following diagnostic parameters are used to diagnose peri-implantitis: 1) peri-implant probing using a periodontal probe, 2) presences of bleeding on probing and suppuration around the implant, 3) increasing mobility, 4) peri-implant radiography, and 5) microbiological analysis. There will be no distinguishing signs of implant mobility until osseointegration is totally lost because the bottom part of the implant retains perfect osseointegration. Mucositis defined as a bacteria-induced, reversible inflammation of the peri-implant soft tissue with edematous enlargement and bleeding while probing [6Smeets R, Henningsen A, Jung O, Heiland M, Hammächer C, Stein JM. Definition, etiology, prevention and treatment of peri-implantitis: A review. Head Face Med 2014; 10: 34. 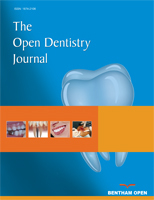 [http://dx.doi.org/10.1186/1746-160X-10-34] [PMID: 25185675] , 9Wilson V. An insight into peri-implantitis: A systematic literature review. Prim Dent J 2013; 2(2): 69-73. [http://dx.doi.org/10.1308/205016813806144209] [PMID: 23726497] , 10Schwarz F, Sahm N, Becker J. Aktuelle aspekte zur therapie periimplantärer entzündungen. Die Quintessenz 2008; 59(5): 521-30.]. These are characteristic signs, but they are at times not clearly evident. In contrast to mucositis, peri-implantitis is a progressive and irreversible disease of peri-implant tissue [6Smeets R, Henningsen A, Jung O, Heiland M, Hammächer C, Stein JM. Definition, etiology, prevention and treatment of peri-implantitis: A review. Head Face Med 2014; 10: 34. [http://dx.doi.org/10.1186/1746-160X-10-34] [PMID: 25185675] , 9Wilson V. An insight into peri-implantitis: A systematic literature review. Prim Dent J 2013; 2(2): 69-73. [http://dx.doi.org/10.1308/205016813806144209] [PMID: 23726497] ], Bleeding on probing, bone destruction and deep pockets may have other possible cause than inflammation, e.g. too deep placement of the implant [6Smeets R, Henningsen A, Jung O, Heiland M, Hammächer C, Stein JM. Definition, etiology, prevention and treatment of peri-implantitis: A review. Head Face Med 2014; 10: 34. [http://dx.doi.org/10.1186/1746-160X-10-34] [PMID: 25185675] , 11Hämmerle CH, Brägger U, Bürgin W, Lang NP. The effect of subcrestal placement of the polished surface of ITI implants on marginal soft and hard tissues. Clin Oral Implants Res 1996; 7(2): 111-9. [http://dx.doi.org/10.1034/j.1600-0501.1996.070204.x] [PMID: 9002829] ]. Furthermore, type, and shape of the implant, connection type, abutment, type of prosthesis and supra-structure material have an influence on surrounding tissues of the implant [6Smeets R, Henningsen A, Jung O, Heiland M, Hammächer C, Stein JM. Definition, etiology, prevention and treatment of peri-implantitis: A review. Head Face Med 2014; 10: 34. [http://dx.doi.org/10.1186/1746-160X-10-34] [PMID: 25185675] , 12Mombelli A, Müller N, Cionca N. The epidemiology of peri-implantitis. Clin Oral Implants Res 2012; 23(Suppl. 6): 67-76. [http://dx.doi.org/10.1111/j.1600-0501.2012.02541.x] [PMID: 23062130] ]. There is evidence that poor oral hygiene, a history of periodontitis, and cigarette smoking is risk indicators for peri-implant disease [13Heitz-Mayfield LJ. Peri-implant diseases: Diagnosis and risk indicators. J Clin Periodontol 2008; 35(8)(Suppl. ): 292-304. [http://dx.doi.org/10.1111/j.1600-051X.2008.01275.x] [PMID: 18724857] ]. Further factors with a suggested association include alcohol consumption, diabetes, hepatitis, and specific IL-1 genotypes [13Heitz-Mayfield LJ. Peri-implant diseases: Diagnosis and risk indicators. J Clin Periodontol 2008; 35(8)(Suppl. ): 292-304. [http://dx.doi.org/10.1111/j.1600-051X.2008.01275.x] [PMID: 18724857] ]. Latest overview of systematic reviews concludes that 1) incidence of peri-implantitis was more in subjects with periodontitis, and smokers; 2) the microbiological picture was different from periodontitis; 3) uncontrolled diabetes and cardiovascular disease was a potential risk factor for peri-implant disease; 4) most of the peri-implantitis treatment options provide successful outcome, and 5) maintenance phase plays a crucial role in subjects with a high risk of peri-implantitis [14Rams TE, Link CC Jr. Microbiology of failing dental implants in humans: Electron microscopic observations. J Oral Implantol 1983; 11(1): 93-100. [PMID: 6584637] ]. Mechanical debridement with or without antimicrobial therapy. Mechanical debridement with or without local drug delivery. Mechanical debridement combined with the use of LASER. Surgical debridement with Guided Bone Regeneration (GBR). Therefore, strategies for inhibition and treatment of peri-implant pathology should be incorporated in modern rehabilitation conceptions in dentistry. 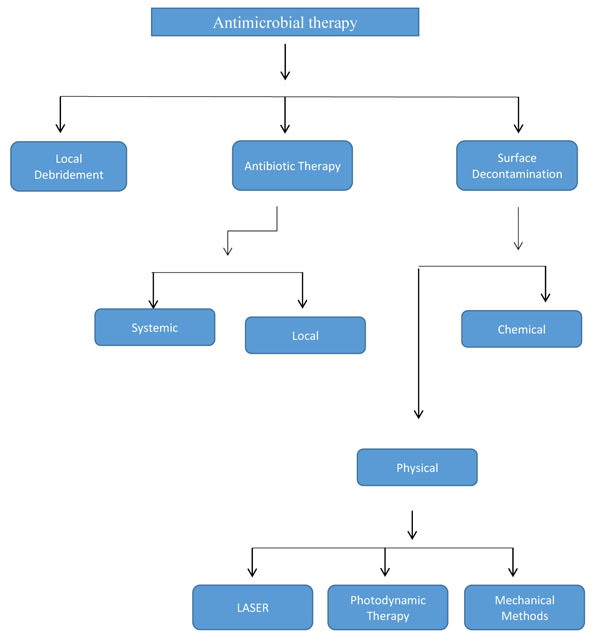 The current paper gives an efficient overview of the pathogenesis, microbiological etiology and antimicrobial therapy for the treatment of peri-implantitis. The role of bacterial etiology in peri-implantitis has been discussed and debated since the inception of dental implantology. The deceptive clinical and microbiological relationship of peri-implantitis and periodontitis encouraged many periodontal researchers and authors form a periodontics community to acquire involvement in implant research. Meanwhile, bacteria were recognized as a primary etiological factor of periodontal disease, this fact has opened an area of interest for several lines of research. The prime evidence for a specific role of bacteria in peri-implantitis came from microbiological examination of samples taken from various dental implants with deep pockets, the results revealed high levels of spirochetes in case of deep pockets, whereas implants with shallow and healthy pockets showed predominantly coccoid microorganism [15Ting M, Craig J, Balkin BE, Suzuki JB. Peri-implantitis: A comprehensive overview of systematic reviews. J Oral Implantol 2018; 44(3): 225-47. [http://dx.doi.org/10.1563/aaid-joi-D-16-00122] [PMID: 29182489] ]. Researches on the basis of various longitudinal studies put forth the concept that the composition of microbial flora present around the implant is determined by the species of bacteria which was present inside oral cavity prior to implant placement. The bacteria colonizing implants in the edentulous patients originate mainly from the surfaces of adjacent soft tissues. Patients who lost their teeth due to periodontitis had a poorer outcome of implant therapy than edentulous subjects without such a history. Based on the fact that these patients have an obvious susceptibility to periodontitis and based on the high probability of transmission of periodontal pathogenic microbes these patients should be treated with caution [15Ting M, Craig J, Balkin BE, Suzuki JB. Peri-implantitis: A comprehensive overview of systematic reviews. J Oral Implantol 2018; 44(3): 225-47. [http://dx.doi.org/10.1563/aaid-joi-D-16-00122] [PMID: 29182489] ]. Different approaches have been used to study the microbiology of peri-implantitis including phase-contrast microscopy to study bacterial morphotypes, [16Listgarten MA, Helldén L. Relative distribution of bacteria at clinically healthy and periodontally diseased sites in humans. J Clin Periodontol 1978; 5(2): 115-32. [http://dx.doi.org/10.1111/j.1600-051X.1978.tb01913.x] [PMID: 350909] ] culturing, [17Leonhardt A, Renvert S, Dahlén G. Microbial findings at failing implants. Clin Oral Implants Res 1999; 10(5): 339-45. [http://dx.doi.org/10.1034/j.1600-0501.1999.100501.x] [PMID: 10551058] ] latex agglutination test, [18Kalykakis GK, Mojon P, Nisengard R, Spiekermann H, Zafiropoulos GG. Clinical and microbial findings on osseo-integrated implants; comparisons between partially dentate and edentulous subjects. Eur J Prosthodont Restor Dent 1998; 6(4): 155-9. [PMID: 10596616] ] checkerboard DNA-DNA hybridsation [19Hultin M, Gustafsson A, Hallström H, Johansson LA, Ekfeldt A, Klinge B. Microbiological findings and host response in patients with peri-implantitis. Clin Oral Implants Res 2002; 13(4): 349-58. [http://dx.doi.org/10.1034/j.1600-0501.2002.130402.x] [PMID: 12175371] ] or polymerase chain reaction [20Kocar M, Seme K, Hren NI. Characterization of the normal bacterial flora in peri-implant sulci of partially and completely edentulous patients. Int J Oral Maxillofac Implants 2010; 25(4): 690-8. [PMID: 20657863] , 21van Winkelhoff AJ. Antibiotics in the treatment of peri-implantitis. Eur J Oral Implantology 2012; 5(Suppl. ): S43-50. [PMID: 22834393] ]. Peri-implantitis is a mixed and variable poly-microbial infection, although generally dominated by Gram-negative anaerobic bacteria [22Charalampakis G, Leonhardt Å, Rabe P, Dahlén G. Clinical and microbiological characteristics of peri-implantitis cases: A retrospective multicentre study. Clin Oral Implants Res 2012; 23(9): 1045-54. [http://dx.doi.org/10.1111/j.1600-0501.2011.02258.x] [PMID: 22092339] ]. In one of the landmark study, 36 deteriorating implant sites were tested for the occurrence of periodontopathic organisms A. actinomycetemcomitans, P. intermedia, and Porphyromonas gingivalis. One patient with a failing implant was associated with higher levels of P. gingivalis. Two further patients with unsuccessful blades showed association with high levels of P. intermedia [23Becker W, Becker BE, Newman MG, Nyman S. Clinical and microbiologic findings that may contribute to dental implant failure. Int J Oral Maxillofac Implants 1990; 5(1): 31-8. [PMID: 2391137] ]. In another longitudinal study ten edentulous and 14, partially edentulous patients were tested for the existence of periodontal pathogens around osseointegrated dental implant by using a latex agglutination test. The result of the microbiological test revealed that A. actinomycetemcomitans was associated with 12% of edentulous patients and 17% of the partially edentulous patients. P. intermedia and P. gingivalis were associated with 39% of the partially edentulous and 19% fully edentulous subjects respectively. The results of the study revealed that Implants associated with one of the three pathogenic bacteria had significantly increased pocket depths, a higher bleeding on probing and a higher Crevicular Fluid (GCF) flow rate [24George K, Zafiropoulos G-GK, Murat Y, Hubertus S, Nisengard RJ. Clinical and microbiological status of osseointegrated implants. J Periodontol 1994; 65(8): 766-70. [http://dx.doi.org/10.1902/jop.1994.65.8.766] [PMID: 7965553] ]. The composition of the submucosal biofilm associated with peri-implantitis and periodontitis are found to be similar, such as the species of the red and orange complexes, Prevotella nigrescens, Campylobacter rectus and A. actinomycetemcomitans, particularly serotype b, as well as Staphylococcus aureus, Enteric bacilli, and Candida albicans [25Berglundh T, Zitzmann NU, Donati M. Are peri-implantitis lesions different from periodontitis lesions? J Clin Periodontol 2011; 38(Suppl. 11): 188-202. [http://dx.doi.org/10.1111/j.1600-051X.2010.01672.x] [PMID: 21323715] -28Heitz-Mayfield LJ, Lang NP. Comparative biology of chronic and aggressive periodontitis vs. peri-implantitis. Periodontol 2000 2010; 53: 167-81. [http://dx.doi.org/10.1111/j.1600-0757.2010.00348.x] [PMID: 20403112] ]. The variations noted in the soft and hard tissues (clinically characterized by an increase in pocket depth and bone loss) are related to considerable changes in the composition of the subgingival microbiota, including [29Quirynen M, De Soete M, van Steenberghe D. Infectious risks for oral implants: A review of the literature. Clin Oral Implants Res 2002; 13(1): 1-19. [http://dx.doi.org/10.1034/j.1600-0501.2002.130101.x] [PMID: 12005139] ]: A greater than before total bacterial burden or load, with an increase in the percentage of A. actinomycetemcomitans, Fusobacterium species, Prevotella intermedia and Porphyromonasgingivalis, a decrease in the percentage of all cocci, and an important rise in the proportion of motile organisms and spirochetes [26Ata-Ali J, Candel-Marti ME. Flichy-FernándezAJ, Peñarrocha-Oltra D, Balaguer-Martinez JF, PeñarrochaDiago M. Peri-implantitis: associated microbiota and treatment. Med Oral Patol Oral Cir Bucal 2011; 16: 937-43. [http://dx.doi.org/10.4317/medoral.17227] ]. Staphylococcus aureus, in particular, appears to play a principal role in the development of a peri-implantitis [27Shibli JA, Melo L, Ferrari DS, Figueiredo LC, Faveri M, Feres M. Composition of supra- and subgingival biofilm of subjects with healthy and diseased implants. Clin Oral Implants Res 2008; 19(10): 975-82. [http://dx.doi.org/10.1111/j.1600-0501.2008.01566.x] [PMID: 18828812] ]. This bacterium shows a high affinity to titanium and has according to the results of Salvi et al., a high positive (80%) and negative (90%) predictive value [30Salvi GE, Fürst MM, Lang NP, Persson GR. One-year bacterial colonization patterns of Staphylococcus aureus and other bacteria at implants and adjacent teeth. Clin Oral Implants Res 2008; 19(3): 242-8. [http://dx.doi.org/10.1111/j.1600-0501.2007.01470.x] [PMID: 18177429] ]. The bacterial species of subgingival plaque may differ in peri-implantitis lesions in dentate subjects as compared to the lesions in fully edentulous subjects. Plaque samples of edentulous patients revealed a higher number of black pigmented gram-negative anaerobic species when compared to the plaque samples from fully edentulous patients [31Apse P, Ellen RP, Overall CM, Zarb GA. Microbiota and crevicular fluid collagenase activity in the osseointegrated dental implant sulcus: A comparison of sites in edentulous and partially edentulous patients. J Periodontal Res 1989; 24(2): 96-105. [http://dx.doi.org/10.1111/j.1600-0765.1989.tb00863.x] [PMID: 2542514] ]. It has been proposed that the pathogenic microbes A. actinomycetemcomitans and P. gingivalis are not detectable on oral mucous surfaces after complete edentulism. Results from the various studies have revealed that pathogenic microbes like A. actinomycetemcomitans, P. gingivalis, T. forsythia, and T. denticola were commonly found in the peri-implant sulci of partially edentulous patients, but these microbes were not detected in the peri-implant sulci of completely edentulous patients [20Kocar M, Seme K, Hren NI. Characterization of the normal bacterial flora in peri-implant sulci of partially and completely edentulous patients. Int J Oral Maxillofac Implants 2010; 25(4): 690-8. [PMID: 20657863] , 32Karbach J, Callaway A, Kwon YD, d’Hoedt B, Al-Nawas B. Comparison of five parameters as risk factors for peri-mucositis. Int J Oral Maxillofac Implants 2009; 24(3): 491-6. [PMID: 19587872] ]. In conclusion, healthy peri-implant tissue acts as a biological barrier to a few of the agents that cause peri-implant disease, and if ruined, bacterial contamination spreads straight to the bone, leading to its rapid destruction. Periodontal history and periodontal condition of the patient plays a significant role in the development of peri-implantitis. More information is needed on the prevalence and the role of unusual pathogens such as cocci, enteric rods and yeasts [21van Winkelhoff AJ. Antibiotics in the treatment of peri-implantitis. Eur J Oral Implantology 2012; 5(Suppl. ): S43-50. [PMID: 22834393] ]. As peri-implantitis is instigated by a pathogenic microorganism, the management of the disease should comprise antimicrobial therapy, and the ultimate aim of therapy should include disease resolution and conservation of supporting tissue [33Lindhe J, Meyle J. Peri-implant diseases: Consensus report of the Sixth European Workshop on Periodontology. J Clin Periodontol 2008; 35(8)(Suppl. ): 282-5. [http://dx.doi.org/10.1111/j.1600-051X.2008.01283.x] [PMID: 18724855] ]. Numerous clinical studies and reports revealed that peri-implant tissues healed after the suppression of the peri-implant pathogenic microorganisms by mechanical and chemical debridement. The consensus report from the 8th European Workshop on Periodontology stressed to deliver standard therapy for the treatment of peri-implant diseases [34Sanz M, Chapple IL. Clinical research on peri-implant diseases: Consensus report of working group 4. J Clin Periodontol 2012; 39(Suppl. 12): 202-6. [http://dx.doi.org/10.1111/j.1600-051X.2011.01837.x] [PMID: 22533957] ]. Various treatment options for treatment of peri-implantitis have been documented in the literature and maximum of them emphasize on decontamination of the implant surface (Fig. 1 ). Flow chart showing treatment options available for peri-implantitis. Titanium implants are covered by a thin layer of titanium dioxide, which appears to stimulate osseointegration with the surrounding bone. Contamination of implant surfaces leads to loss of osseointegration and ultimately implants failure. According to most of the clinicians the term Contaminationdenotethe transfer of living microorganisms or as a minimum of lipopolysaccharide secreted from the bacteria. Maintenance of dental implants should be done by the plastic instruments: such as polishing with a rubber cup and paste, floss or using plastic scalers. Use of plastic instruments has shown no damage to the implant surface unlike metal instruments and scalers [7Prathapachandran J, Suresh N. Management of peri-implantitis. Dent Res J (Isfahan) 2012; 9(5): 516-21. [http://dx.doi.org/10.4103/1735-3327.104867] [PMID: 23559913] , 35Matarasso S, Quaremba G, Coraggio F, Vaia E, Cafiero C, Lang NP. Maintenance of implants: An in vitro study of titanium implant surface modifications subsequent to the application of different prophylaxis procedures. Clin Oral Implants Res 1996; 7(1): 64-72. [http://dx.doi.org/10.1034/j.1600-0501.1996.070108.x] [PMID: 9002824] ]. Use of ultrasonic scalers with a nonmetallic tip have shown no alteration in the surface of the implant [7Prathapachandran J, Suresh N. Management of peri-implantitis. Dent Res J (Isfahan) 2012; 9(5): 516-21. [http://dx.doi.org/10.4103/1735-3327.104867] [PMID: 23559913] ]. The result of the study done by Karring et al., revealed that sub-mucosal debridement alone is not adequate for the decontamination of the surface of the implant with deep peri-implant pockets and exposed threads [36Karring ES, Stavropoulos A, Ellegaard B, Karring T. Treatment of peri-implantitis by the Vector system. Clin Oral Implants Res 2005; 16(3): 288-93. [http://dx.doi.org/10.1111/j.1600-0501.2005.01141.x] [PMID: 15877748] ]. Hence, adjunctive peri-implant modalities such as antibiotics, antiseptics, and ultrasonic and laser treatments, have been projected to improve the non-surgical treatment alternative of peri-implant mucositis and peri-implantitis [7Prathapachandran J, Suresh N. Management of peri-implantitis. Dent Res J (Isfahan) 2012; 9(5): 516-21. [http://dx.doi.org/10.4103/1735-3327.104867] [PMID: 23559913] ]. Knowledge with respect to the presence of an etiologic microorganism is essential to formulate a critical decision with respect to systemic or local antibiotic therapy [7Prathapachandran J, Suresh N. Management of peri-implantitis. Dent Res J (Isfahan) 2012; 9(5): 516-21. [http://dx.doi.org/10.4103/1735-3327.104867] [PMID: 23559913] ]. Even though the composition of the subgingival microbial flora is significant for the antibiotic selection, distribution patterns of pathogenic microbes are also key in decision making for the administration of antibiotics [7Prathapachandran J, Suresh N. Management of peri-implantitis. Dent Res J (Isfahan) 2012; 9(5): 516-21. [http://dx.doi.org/10.4103/1735-3327.104867] [PMID: 23559913] ]. No clinical study favors the sole prescription of antibiotics for the treatment of peri-implant disease. Consensus from the 8th European Workshop on Periodontology stressed the fact that randomized clinical trials are required to test the role of supportive antimicrobial therapy on treatment results of peri-implant pathology [37Sanz M, Chapple IL. Clinical research on peri-implant diseases: Consensus report of working group 4. J Clin Periodontol 2012; 39(Suppl. 12): 202-6. [http://dx.doi.org/10.1111/j.1600-051X.2011.01837.x] [PMID: 22533957] ]. An uncontrolled study done by Mombelli has evaluated the role of systemic antimicrobial therapy with of non-surgical therapy in the treatment of peri-implantitis. The result exhibited that the combination of local debridement and disinfection combined with a systemic antimicrobial therapy can improve peri-implantitis lesion [38Mombelli A, Lang NP. Antimicrobial treatment of peri-implant infections. Clin Oral Implants Res 1992; 3(4): 162-8. [http://dx.doi.org/10.1034/j.1600-0501.1992.030402.x] [PMID: 1298430] ]. A recent study has reported that there is no impact of adjunctive systemic antibiotics on treatment success of implants with a non-modified surface. Whereas they found a conclusive effect on the treatment of implants with a modified surface [39Carcuac O, Derks J, Charalampakis G, Abrahamsson I, Wennström J, Berglundh T. Adjunctive systemic and local antimicrobial therapy in the surgical treatment of peri-implantitis: A randomized controlled clinical trial. J Dent Res 2016; 95(1): 50-7. [http://dx.doi.org/10.1177/0022034515601961] [PMID: 26285807] ]. In one of the in-vitro study the biofilm-coated implants were treated with different antibiotics: 1) gentamicin 2) vancomycin 3) gentamicin + rifampin or vancomycin + rifampin. The results revealed that systemic ceftriaxone alone was ineffective, a combination of systemic ceftriaxone and local tobramycin was significantly better than other groups. All implants treated with systemic ceftriaxone and local gentamicin were sterile [40van der Horst AS, Medda S, Ledbetter E, et al. Combined local and systemic antibiotic treatment is effective against experimental Staphylococcus aureus peri-implant biofilm infection. J Orthop Res 2015; 33(9): 1320-6. [http://dx.doi.org/10.1002/jor.22910] [PMID: 25877525] ]. In the case of generalized issue, antibiotic regimen should be prescribed on the basis of collected microbiological information. Lang et al., propose the antibiotic regimes as follows: systemic ornidazole 500 mg twice a day for ten days or metronidazole 250 mg thrice a day for ten days or a once daily combination of metronidazole 500 mg and amoxicillin 375 mg for ten days [41Lang NP, Wilson TG, Corbet EF. Biological complications with dental implants: Their prevention, diagnosis and treatment. Clin Oral Implants Res 2000; 11(Suppl. 1): 146-55. [http://dx.doi.org/10.1034/j.1600-0501.2000.011S1146.x] [PMID: 11168263] ]. The studies conducted by Hallstrom et al., in 2012 had used systemic antibiotic azithromycin for 4 days. After 6 months of follow up, there was an improvement only in oral hygiene but this study could not support its claim with authentication materials [42Hallström H, Persson GR, Lindgren S, Olofsson M, Renvert S. Systemic antibiotics and debridement of peri-implant mucositis. A randomized clinical trial. J Clin Periodontol 2012; 39(6): 574-81. [http://dx.doi.org/10.1111/j.1600-051X.2012.01884.x] [PMID: 22571225] ]. The advantages of local administration of antibiotics as compared to systemic antibiotics delivery are: the high concentrations at the local site, the reduced risk for side and adverse effects, no chance of drug interaction, reduced risk of the antibiotic-resistant bacteria. The study conducted by Schwarz et al., revealed that mechanical debridement by plastic curettes in addition with antiseptic (0.2% chlorhexidine) therapy may bring about statistically significant improvement in clinical parameters of the peri-implantitis at 6 months in comparison with baseline, for the treatment of peri-implantitis [43Schwarz F, Sculean A, Bieling K, Ferrari D, Rothamel D, Becker J. Two-year clinical results following treatment of peri-implantitis lesions using a nanocrystalline hydroxyapatite or a natural bone mineral in combination with a collagen membrane. J Clin Periodontol 2008; 35(1): 80-7. [http://dx.doi.org/10.1111/j.1600-051X.2007.01168.x] [PMID: 18173402] ]. Renvert et al., assessed the treatment in 32 patients, comparing minocycline microspheres and chlorhexidine gel with mechanical debridement. Post-one-year follow-up in both study group revealed improvement in plaque index, pocket depth and bleeding on probing [44Renvert S, Lessem J, Dahlén G, Lindahl C, Svensson M. Topical minocycline microspheres versus topical chlorhexidine gel as an adjunct to mechanical debridement of incipient peri-implant infections: A randomized clinical trial. J Clin Periodontol 2006; 33(5): 362-9. [http://dx.doi.org/10.1111/j.1600-051X.2006.00919.x] [PMID: 16634959] ]. The case-cohort study by Salvi et al., evaluates effects of locally delivered minocycline microspheres in peri-implantitis cases. At the end of 12 months, the period author found that there was a marked decline in bleeding on probing, Pocket depth and a significant gain in the clinical attachment level [45Salvi GE, Persson GR, Heitz-Mayfield LJ, Frei M, Lang NP. Adjunctive local antibiotic therapy in the treatment of peri-implantitis II: Clinical and radiographic outcomes. Clin Oral Implants Res 2007; 18(3): 281-5. [http://dx.doi.org/10.1111/j.1600-0501.2007.01377.x] [PMID: 17355354] ]. A randomized, single-blind controlled trial conducted by Büchter et al., on 28 partially edentulous patients, for 5.2 years to examine the additional clinical effects of 8.5% doxycycline. Mechanical treatment was given to the control group whereas mechanical treatment plus local doxycycline was employed in the test group. At end of 18 weeks of the study, significant reduction in Bleeding on probing and CAL in doxycycline group was reported as compared to the control group [46Büchter A, Meyer U, Kruse-Lösler B, Joos U, Kleinheinz J. Sustained release of doxycycline for the treatment of peri-implantitis: Randomised controlled trial. Br J Oral Maxillofac Surg 2004; 42(5): 439-44. [http://dx.doi.org/10.1016/j.bjoms.2004.06.005] [PMID: 15336770] ]. If it is made mandatory that mechanical and antiseptic protocols are followed prior to administering antibiotic therapy, it is most likely then that shallow peri-implant infection may be effectively controlled using antibiotics [7Prathapachandran J, Suresh N. Management of peri-implantitis. Dent Res J (Isfahan) 2012; 9(5): 516-21. [http://dx.doi.org/10.4103/1735-3327.104867] [PMID: 23559913] ]. The objective of mechanical decontamination of implant surface is to eliminate the toxic products, so as to produce a surface which is compatible for the re-osseointegration. Implantoplasty is a technique that eliminates surface roughness together with thread to facilitate oral hygiene maintenance around the implant. A study done by Romeo et al. showed improvements in clinical and radiological parameters compared with those without implantoplasty [47Romeo E, Ghisolfi M, Murgolo N, Chiapasco M, Lops D, Vogel G. Therapy of peri-implantitis with resective surgery. A 3-year clinical trial on rough screw-shaped oral implants. Part I: Clinical outcome. Clin Oral Implants Res 2005; 16(1): 9-18. [http://dx.doi.org/10.1111/j.1600-0501.2004.01084.x] [PMID: 15642026] ]. Use of sandblasting technique on implant surfaces makes them less vulnerable to bacterial adhesion, the possible reason may be the modification of the surface texture [48Duarte PM, Reis AF, de Freitas PM, Ota-Tsuzuki C. Bacterial adhesion on smooth and rough titanium surfaces after treatment with different instruments. J Periodontol 2009; 80(11): 1824-32. [http://dx.doi.org/10.1902/jop.2009.090273] [PMID: 19905952] ]. Plastic curettes produce minimal or no damage at all to the implant surface when compared to the use of metallic curettes [49Mengel R, Meer C, Flores-de-Jacoby L. The treatment of uncoated and titanium nitride-coated abutments with different instruments. Int J Oral Maxillofac Implants 2004; 19(2): 232-8. [PMID: 15101595] ]. A review accomplished that bicarbonate air-powder abrasion systems and physiological saline acquire the best outcome for eliminating endotoxins from implant surface [50Sánchez-Gárces MA, Gay-Escoda C. Periimplantitis. Med Oral Patol Oral Cir Bucal 2004; 9(Suppl. ): 9-74, 63-69. [PMID: 15580138] ]. Decontamination by the laser is based on the thermal effect. Er: YAG laser studied extensively in recent years and the result revealed that it has bactericidal effects without damage implant surfaces [51Kreisler M, Kohnen W, Marinello C, et al. Bactericidal effect of the Er:YAG laser on dental implant surfaces: An in vitro study. J Periodontol 2002; 73(11): 1292-8. [http://dx.doi.org/10.1902/jop.2002.73.11.1292] [PMID: 12479633] ]. Results from the study done by Schwarz et al., revealed that the Er: YAG laser has limited efficacy to a 6-month period, chiefly for advanced peri-implantitis lesions. It was further recommended that a single course of Er: YAG laser may not be sufficient for accomplishing a stable therapy, supplementary use of the Er: YAG laser and/or osseous regenerative techniques, might be required to attain more stable therapy outcomes [52Schwarz F, Sculean A, Bieling K, Ferrari D, Rothamel D, Becker J. Two-year clinical results following treatment of peri-implantitis lesions using a nanocrystalline hydroxyapatite or a natural bone mineral in combination with a collagen membrane. J Clin Periodontol 2008; 35(1): 80-7. [http://dx.doi.org/10.1111/j.1600-051X.2007.01168.x] [PMID: 18173402] ]. The results from the study showed that Nd: YAG and Ho: YAG lasers bring into about significant alteration to the surfaces studied, so not recommended for decontamination [53Kreisler M, Götz H, Duschner H, D’Hoedt B. Effect of Nd:YAG, Ho:YAG, Er:YAG, CO2, and GaAIAs laser irradiation on surface properties of endosseous dental implants. Int J Oral Maxillofac Implants 2002; 17(2): 202-11. [PMID: 11958402] ]. A literature review concluded that the use of CO2 and diode lasers are effective in decontamination without producing alterations to the implant surfaces [54Romanos GE, Gutknecht N, Dieter S, Schwarz F, Crespi R, Sculean A. Laser wavelengths and oral implantology. Lasers Med Sci 2009; 24(6): 961-70. [http://dx.doi.org/10.1007/s10103-009-0676-1] [PMID: 19430724] ]. It is a technique that uses a photosensitizing substance with a laser. The byproduct produced is able to destroy the bacterial cells. PDT exhibited more efficiency for eliminating bacteria from implant surfaces than laser irradiation alone [55Marotti J, Tortamano P, Cai S, Ribeiro MS, Franco JE, de Campos TT. Decontamination of dental implant surfaces by means of photodynamic therapy. Lasers Med Sci 2013; 28(1): 303-9. [http://dx.doi.org/10.1007/s10103-012-1148-6] [PMID: 22790655] ]. Results from an in vitro study combining photosensitization by toluidine blue solution and soft laser revealed that eradication of microbes was possible from the titanium surfaces without modification of the same [56Hayek RR, Araújo NS, Gioso MA, et al. Comparative study between the effects of photodynamic therapy and conventional therapy on microbial reduction in ligature-induced peri-implantitis in dogs. J Periodontol 2005; 76(8): 1275-81. [http://dx.doi.org/10.1902/jop.2005.76.8.1275] [PMID: 16101358] ]. A chemical decontamination method includes the use of various anti-microbial agents like chlorhexidine, tetracycline or minocycline, citric acid, hydrogen peroxide, and phosphoric acid, as an adjunct with mechanical debridement. Application of citric acid (40%) with pH 1 for 30-60 seconds on hydroxyapatite surfaces demonstrated its conclusive efficacy as agent for the reduction of microbial growth [52Schwarz F, Sculean A, Bieling K, Ferrari D, Rothamel D, Becker J. Two-year clinical results following treatment of peri-implantitis lesions using a nanocrystalline hydroxyapatite or a natural bone mineral in combination with a collagen membrane. J Clin Periodontol 2008; 35(1): 80-7. [http://dx.doi.org/10.1111/j.1600-051X.2007.01168.x] [PMID: 18173402] ]. Machined titanium surface was shown to be decontaminated more efficiently by the applications of tetracycline than any other surface types. In an in vitro experiment, titanium alloy and hydroxyapatite specimens were contaminated with endotoxin and then the specimens were treated with citric acid, chlorhexidine gluconate, hydrogen peroxide, chloramine T, stannous fluoride, tetracycline-HCl, sterile water, a plastic sonic scaler tip, and an air-powder abrasive unit to decontaminate the surface. The results of the experiment revealed that 60-second polish with sterile water demonstrated its efficacy to eliminate considerable amounts of lipopolysaccharide in comparison with untreated surfaces. The air powder abrasive was able to remove a considerable amount of lipopolysaccharide from titanium specimen in comparison with other treatment options. Citric acid showed the better result when used for the treatment of hydroxyapatite surfaces. Electron microscopic examination revealed increased surface roughness of the hydroxyapatite when treated with citric acid, chlorhexidine gluconate, hydrogen peroxide, tetracycline HCl, stannous, fluoride or polymyxin B [57Zablotsky M, Diedrich D, Meffert R, Wittrig E. Detoxification of the endotoxin infected hydroxylapatite coated implant surface. Int J Oral Maxillofac Implants 1991; 8: 45-50.]. In one of the experimental animal study different surface decontamination methods, (I) air-powder abrasive followed by citric acid application, (II) air-powder abrasive alone, (III) saline soaked gauze followed by citric acid application, and (IV) gauze soaked alternately in 0.1% chlorhexidine and saline were evaluated clinically, radiographically and histologically. The result of the experiment revealed that there was no significant difference between any of the methods used [58Schou S, Holmstrup P, Jørgensen T, et al. Implant surface preparation in the surgical treatment of experimental peri-implantitis with autogenous bone graft and ePTFE membrane in cynomolgus monkeys. Clin Oral Implants Res 2003; 14(4): 412-22. [http://dx.doi.org/10.1034/j.1600-0501.2003.00912.x] [PMID: 12869003] ]. A literature review by Claffey et al., in which he assessed diverse decontamination protocols using sterile saline solution, chlorhexidine, citric acid, and hydrogen peroxide, were unsuccessful to confirm any significant difference in the efficacy of different agents [59Claffey N, Clarke E, Polyzois I, Renvert S. Surgical treatment of peri-implantitis. J Clin Periodontol 2008; 35(8)(Suppl. ): 316-32. [http://dx.doi.org/10.1111/j.1600-051X.2008.01277.x] [PMID: 18724859] ]. Most in vivo studies use empirical combinations of chemical agents and mechanical procedures with or without systemic antibiotic treatment. A comprehensive maintenance regime with satisfactory home care is important for the long-term success and survival of dental implant [60Mombelli A. Microbiology and antimicrobial therapy of peri-implantitis. Periodontol 2000 2002; 28: 177-89. [http://dx.doi.org/10.1034/j.1600-0757.2002.280107.x] [PMID: 12013341] ]. Prosthetic design of the restoration should facilitate oral hygiene by the patients as home care measure. Over contoured prosthesis and too deep placed dental implants hinders with oral hygiene maintenance. Presence of band of keratinized gingiva around implant improves oral hygiene maintained by the patient, thus maintaining a good peri-implant health [61Wang WC, Lagoudis M, Yeh CW, Paranhos KS. Management of peri-implantitis - A contemporary synopsis. Singapore Dent J 2017; 38: 8-16. [http://dx.doi.org/10.1016/j.sdj.2017.10.001] [PMID: 29229078] ]. It has been concluded from a recent study that peri-implant inflammation was less likely to progress into peri-implantitis in patients who had regular maintenance [62Lin GH, Chan HL, Wang HL. The significance of keratinized mucosa on implant health: A systematic review. J Periodontol 2013; 84(12): 1755-67. [http://dx.doi.org/10.1902/jop.2013.120688] [PMID: 23451989] ]. Evidence from the available studies shows that local or systemic therapy for peri-implantitis has a beneficial effect on the treatment outcome [63Costa FO, Takenaka-Martinez S, Cota LO, Ferreira SD, Silva GL, Costa JE. Peri-implant disease in subjects with and without preventive maintenance: A 5-year follow-up. J Clin Periodontol 2012; 39(2): 173-81. [http://dx.doi.org/10.1111/j.1600-051X.2011.01819.x] [PMID: 22111654] ]. Although there are studies available that point out the limitations of local therapy. The design of the implant plays a crucial role in the treatment outcome of local therapy. Hollow cylinder implants with advanced peri-implantitis are difficult to treat by local therapy because bacterial contamination of the inner surface of these implants is a major hurdle for the elimination of contamination. In some cases, after local therapy the peri-implant soft tissue morphology favors plaque retention, an added surgical intervention is required to alter tissue morphology to prevent reinfection. Regenerative periodontal therapy in addition to the local antimicrobial therapy showed improved osseointegration [64Hämmerle CHF, Fourmousis I, Winkler JR, Weigel C, Brägger U, Lang NP. Successful bone fill in late peri-implant defects using guided tissue regeneration. A short communication. J Periodontol 1995; 66(4): 303-8. [http://dx.doi.org/10.1902/jop.1995.66.4.303] [PMID: 7782987] , 65Jovanovic SA. The management of peri-implant breakdown around functioning osseointegrated dental implants. J Periodontol 1993; 64: 1176-83. [http://dx.doi.org/10.1902/jop.1993.64.11s.1176] ]. Weiss CM, Weiss A. Principles and practice of implant dentistry 2001. Misch CE. Dental implant prosthetics 2005. Renvert S, Giovannoli J-L. Peri-implantitis 2012. Schwarz F, Sahm N, Becker J. Aktuelle aspekte zur therapie periimplantärer entzündungen. Die Quintessenz 2008; 59(5): 521-30. Zablotsky M, Diedrich D, Meffert R, Wittrig E. Detoxification of the endotoxin infected hydroxylapatite coated implant surface. Int J Oral Maxillofac Implants 1991; 8: 45-50.